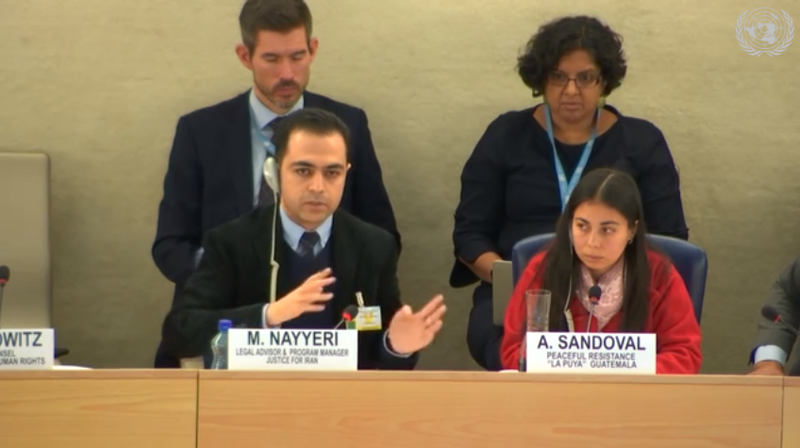 28 November 2018- Lawyer Mohammad Nayyeri, Legal Advisor and Project Manager at Justice For Iran, spoke about the role international businesses play in the suppression of human rights defenders in the Islamic Republic of Iran, during a United Nations session on 27 November. At the session, Mr. Nayyeri spoke about the challenges to decriminalizing human rights defenders’ work in Iran and the role played by international businesses in diminishing the violence against this community. “I wouldn’t be here if I was working from inside Iran,” said Mr. Nayyeri. He explained a number of ways in which Iranian human rights defenders like his own colleagues are targeted, silenced, disproportionately sentenced, and even executed by the Islamic Republic’s authorities. He stated that the lives and security of human rights defenders are under attack by regime forces, noting that among the regime’s violent tactics are seizures of defenders’ assets, torture, and psychological pressuring, often in the form of threats made against family members. He also noted the spreading of malware, website and account hacking, and using social media platforms to smear opposition and disseminate disinformation are some of the regime’s cyber tactics to sabotage and suppress the work of human rights defenders. These tactics are followed by ramped-up charges and harsh sentences from the judiciary. Mr. Nayyeri named fellow human rights defender Abdolfattah Soltani as an example of violent targeting by the regime, stating that Soltani was released the previous week, after seven years of imprisonment. Mr. Nayyeri recommended systematic solutions for decriminalizing the work of human rights defenders in Iran by reiterating the need for judicial independence within the regime. He also highlighted the importance of international businesses attaining a higher level of care in their practices, to protect and respect the communities in Iran facing acts of violence by the regime. Mr. Nayyeri advised international business leaders to develop and practice a higher standard of due diligence, to be applied when doing business in countries like Iran, likening it to existing sectoral practices. He clarified that international corporations and businesses can choose abstinence from empowering perpetrators of violence. 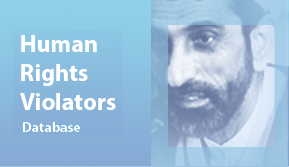 To proactively address the Islamic Republic’’s violence against human rights defenders, Mr. Nayyeri stated that companies must not become complicit in human rights violations by doing business with known violators. 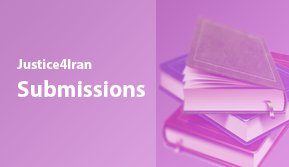 According to the 2016 Silk Road Report by Justice For Iran, international companies in Iran can avoid complicity in human rights violations by relying on internationally recognized standards to inform their business practices and relations. When these standards are applied, when irresponsible behavior and misconduct within companies are brought to light and accounted for, and when companies actively identify, prevent, mitigate(diminish) and account for how they address and manage their actual and potential harm and adverse impacts, then companies take responsibility for the protection of human rights and its defenders.